Though November has just transformed itself into December here, still Ted Hughes’ sodden, rain-soaked poem from Lupercal (1960) comes to mind as I watch the TV footage of floods in the North-West of England. I’ve never thought enough attention has been given to the role of the narrator in this poem. It’s one of the selected poems studied on the Cambridge International Examinations’ A-level. Students are asked to discuss one specific poem in detail or two poems from a more thematic perspective. What follows is a loose version of the first type of question (apologies for some loss of formatting in the poem itself). NB. 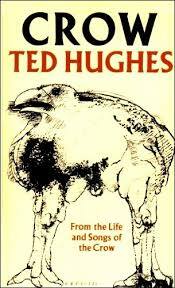 For another close discussion of an early Ted Hughes poem – ‘Meeting’ – click here. Hughes opens the poem with a bewildering mix of images of motion and stasis. Flooding must account for the “drowned dog” (more literal than figurative or colloquial here) and the absence of a verb emphasizes the stillness of death, the burden of the month, the real entrance way to winter. The land is so sodden as to have suffered inversion to become “the bed of an ancient lake”. It’s an alien landscape – trees (as so often in Hughes) are now composed of industrial “iron” and inevitably “birdless”. Yet in contrast to such stillness, the ditch water (which in summer is a soothing sibilant “seep silent”) is now possessed of a “big voice” composed of brown foam and beside it, the narrator’s boots scrape along the lane. These two sounds are all that can be arrayed against “the hill’s hanging silence” and the contrasts of movement and stillness, noise and silence compose the greater world of this poem. Slower than the change of daylight. Each hand stuffed deeper into the other sleeve. It’s this greater world that the narrator fears and the tramp entrusts himself to. To the narrator, the tramp sleeping in a let of the ditch, is comparable to an animal, a “hedgehog”. In the narrator’s world view, this is no compliment and indeed in the next phrase (line 12), he considers the tramp “dead”. To give the narrator credit he perceives his mistake and next sees the tramp’s vitality, though (in a reversal of our preconceptions) it is his “stillness” rather than animation that “separate[s him] from the death” all around. The animation of the “wind” evokes a corresponding movement in the tramp: “a fresh comfort tightened through him, / Each hand stuffed deeper into the other sleeve”. There is paradox here too in that the tramp’s movements are intended both to shield him from the elements yet also settle him more comfortably among them. Quivered, riddled with the glassy verticals. Lines 18 – 23 seem to represent a moment in which the narrator looks away from the tramp. What he sees is a world he might once have been familiar with dissolving before his very eyes. This is partly a result of optical effects brought on by atmospheric conditions, but Hughes’s language systematically destabilizes the solid and still (the farms, the fields, the thorns) and solidifies the diffuse and shapeless (the wind, the rains). Such a renovation of perception is comparable to the stunned narrator at the end of Hughes’ story ‘The Rain Horse’ (from Wodwo, 1967) who, after the terrifying encounter with the horse, sits “staring at the ground, as if some important part had been cut out of his brain”. The poem’s narrator reports in line 24 that he “stayed on under the welding cold” and the colloquialism of the first two words here implies that any sane person might have retired to shelter; whatever transformative process Hughes is representing in the encounter between narrator and tramp is already under way. The narrator seems to surprise himself by staying as if he were watching the actions of another. The hill where the hare crouched with clenched teeth. In fact he stays to continue to watch the tramp becoming part of the landscape: “I thought what strong trust / Slept in him”. All the critics you’ll read agree this is the key idea; but as Keith Sagar asks: in what exactly does “the tramp trust?” The image of sleep links this trust also to the fields’ “furrows”, to “thorn-roots”, to “buried stones” and to the hill itself where the hare is “crouched with clenched teeth”. Is this merely a trust in a viable future? A sort of wishful thinking? A consolation? Perhaps it is if the furrows imply next year’s crop, the roots suggest the new year’s growth, the stones will be unearthed to build new walls, the hare will survive to unclench in the Spring. There is something Romantically attractive about this reading and we might remember Wordsworth’s encounter with the Leech Gatherer who also seems part of the landscape (“as a huge stone”). Wordsworth is equally uncertain of the man’s status: “not all alive nor dead, / Nor all asleep”. As their conversation continues, the Leech Gatherer’s voice becomes indistinguishable from “a stream” and in some low level psychic derangement Wordsworth imagines the Gatherer as “Like one whom I had met with in a dream; / Or like a man from some far region sent, / To give me human strength, by apt admonishment”. Shuttered by a black oak leaned. Their crowns bare and dripped from their feet. But Hughes’ tramp is far less consoling, far more frightening. In the concluding stanzas, the narrator runs away – on the face of it to shelter from the rain though earlier this had not troubled him. He runs into a wood in something of a panic as the breathless, long-delayed verb here suggests: “in the rushing wood // Shuttered by a black oak leaned”. It’s what the narrator encounters in the wood that provides the final piece of the jigsaw for this poem. He confronts death in the shape of a gamekeeper’s gibbet and it is really death in which the tramp trusts, as much as he trusts himself to life. This is the point of the poem’s many transformational oppositions, of stasis and movement, solid and diffuse, sleep and waking, dead and alive. As the “flash and darken” of raindrops on his coat suggest, the tramp’s instinct is to entrust himself to both life and death without making any clear, rational distinction between the two. suggests here. Watch for my comments in a coming essay on Hughes, on several poems like this. My blog so my thoughts. I don’t know if wrong is what we can be over a poem like this.